The fourth K, little Miss Kemper, has brought some sparkle to the other three K's, and I had soooo much fun photographing her at 5 days old. After the family shots, I let Mom sit and rest while I played (um, slaved) with baby K. Talk about a fun job!! K, K, K, and K.
Don't you wish you had a "hard" job like me?! After almost 5 years, a baby girl! This family definitely needed some ruffles and frills to contrast with "all boy" Bryce. As rough and tumble as he is, he is so sweet with his baby sister. Lucy kept us in stitches with her untimely poops and pees, but she was the perfect little model otherwise. 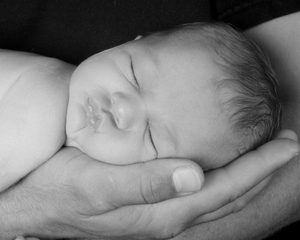 Thanks for allowing me to capture her "newbornness". Is that a sweet brother, or what?! On a very rainy day several years ago I witnessed a car hydroplane, do a 360, go off the road, and flip a few times. Thankfully the driver was unhurt. All these years later I still get very nervous driving in rainy weather and am super cautious always anticipating the worst. Monday at 1:44pm Evangeline Kait arrived. like Maggie, Evie had a scratch on her forehead, but otherwise appeared perfectly "normal". She pinked up quickly, cried appropriately, and nursed eagerly. And yet all of us were apprehensive. Even though her fetal echo-cardiogram and ultrasounds revealed no problems, an echo was scheduled just to sure. Yesterday Evie passed her hearing test and the echo again revealed no problems. She is beautiful and sweet. My mind tells me it is time to relax and enjoy every minute with her, but my insides are still in a bit of a knot waiting for a bomb to drop. After two granddaughters in a row with severe birth defects, it is difficult to drive through the rain and not be apprehensive. I am trying very hard to simply accept God's precious gift and not "borrow trouble". Once she gets home and life's routines return, I think I will relax. God has truly walked through the storm with us with Abby's and Maggie's situations, and I know He will walk through the sunshine with us now. Day two - safe in mama's arms. As I sit here typing, Abby and Maggie are in the other room watching Abby's favorite movie, Winn Dixie. Right now there is a calm in the storm for both of them and hopefully, it will last a long, long time. Last Tuesday my "adopted" nephew and his wife had their first baby - Ethan Samuel. Saturday Clair and I drove to Palmyra to get some snuggles and some pics. Ethan's mom just knew he would scream bloody murder when I undressed him, but I had a nice warm heating pad under the cover and he just kept on snoozing. This was my opportunity to try all natural light, and I loved it. For the rest of you expecting moms out there, I'm telling you that 5 or 6 days is the perfect age; I was able to do anything I wanted with Ethan without him waking up. Here's a peak at handsome Ethan and his wonderful parents. Congratulaions, Seth and Mary! I first photographed this gorgeous family a year ago when Big Sis turned one. Now she has a baby sister that she showers with kisses and hugs. I am anxious to get all of their images edited, but these will do for now. What a perfect family! - two super sweet boys and a beautiful baby girl! Mom and dad are pretty terrific, too. I met this family about a month ago when I took mom's maternity pictures. She was just about the prettiest pregnant woman I have ever seen. This gal had a C-section less than two weeks ago and was squatting, getting up and down off the floor, and never even flinched. Amazing! Big brother, Cole, was so cooperative and helpful, and little brother, Mason, tried his wiggily best. Dad, well, he was quite a sport about the whole thing. What an angel! 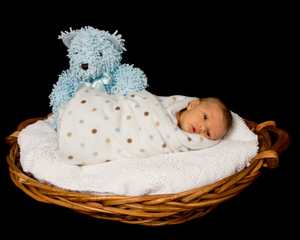 Baby Jackson brought Mommy and Daddy along for a newborn shoot. Grandma came, too; she just can't enough of this handsome little guy. Everyone worked together to make my job super easy: Mom and Dad were so comfortable with Jackson; Jackson slept almost on cue; and grandma worked her magic when needed. I just stepped back and snapped away! I had the privilege of spending the day, and I mean the ENTIRE day, with Brylee Lynn. Her Mom and Dad had quite the time getting their little princess to sleep. She was perfectly happy when she was cozy and eating. 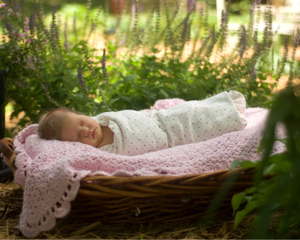 However, that is not a luxury you can enjoy when you are getting newborn pictures taken. She woke up every time she was unwrapped. Her big brother, Gavin, humored us just long enough to capture some adorable shots. Finally, Princess "B" fell sound asleep and we got amazing pictures.